An active work day during summer calls for lightweight workwear with unlimited freedom of movement. MASCOT’s suggestion for summer’s best workwear for the tradesmen who has pockets filled with tools, is the 17049 ¾ length trousers and 17149 shorts from MASCOT® ADVANCED. With 100% stretch material, the ability to move freely is combined with a soft feel against the skin and a low weight. In addition, the user has the possibility to individualise with detachable holster pockets. On the 17049 ¾ length trousers the height of the knee area can be adjusted so the kneepad pockets are always in the right position. Even though the weather calls for shorts, you can still carry all your tools. With the durable 17149 shorts and 17049 ¾ length trousers you get trousers with the same functional holster pockets, integrated thigh pocket and ruler pocket of CORDURA®, as with your long trousers. If your job requires you to work on your knees, you’ll want to have kneepads, which is why the 17049 ¾ length trousers cover your knee and can hold large kneepads. They are a bit shorter on the back of the leg, which minimizes the amount of fabric at the back of the knee. Finally, the kneepads can easily be inserted and removed from the sides during the work day so you don’t get too warm. Holster pockets are almost indispensable in many working situations where you need easy access to tools, screws and bits. But they can be rather difficult to empty when the trousers need to be washed or when you get into the car and don’t want to risk losing the contents. 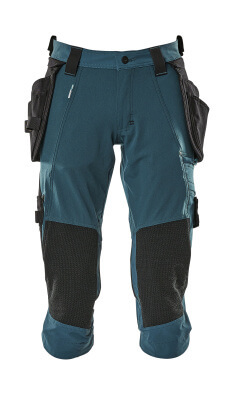 The holster pockets on the MASCOT® ADVANCED 17049 ¾ length trousers and 17149 shorts are easily detachable via a zipper. 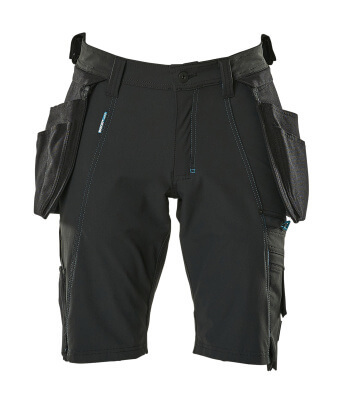 The 17149 shorts and 17049 ¾ length trousers from MASCOT® ADVANCED are available in numerous sizes and colours including dark navy, white, black, dark anthracite, moss green and light khaki.